My all time favorite sermon on the book of Ruth is brilliantly delivered by David Platt, former pastor at Church of Brook Hills in Birmingham, AL. My good friend Paula attends there and told me about it. She even let me borrow the CD’s – twice. I think I still have it. David Platt is a masterful storyteller and brings this story to life like none other. Did you realize when reading chapter one of the book of Ruth that there is no dialogue before verse 8? And in just the first 5 verses a whole lot takes place. Elimelech moves his wife and two sons from Bethlehem to Moab some 40 miles away to escape famine. They go to a land of idolators. Some time after they arrive he dies, his sons marry Moabite women and then the sons die. His wife Naomi is left in a foreign land with no husband and no sons. And she is left with two Moabite daughters-in-law. The women of Moab had been known to indulge in sexual immorality with the Israelite men in the past. Naomi knows this and now she is left with these two women. And to add insult to injury, they are childless as well. Naomi found food, but in those first 5 verses it appears she lost everything else. Unimaginable. Recently my family was blessed with the opportunity to vacation in New York City. While there we saw the hit musical Hamilton. It’s about the life of a founding father of our country, Alexander Hamilton. The story line is captivating and the actors all have phenomenal voices. Eliza Hamilton, wife of Alexander, finds herself yoked to a man she dearly loves who is consumed with his mission in life – helping create our nation. As a result, he spends little time with his family. Eliza is devastated when he has an affair that becomes public. When their eldest son is killed dueling to defend his father’s name. And when Alexander himself is killed in a duel. Unimaginable. Both women lived with the unimaginable. Eliza sings these words after the death of her son. There are moments that the words don’t reach. There are moments too terrible to name… There’s a grace to powerful to name. We push away what we can never understand. 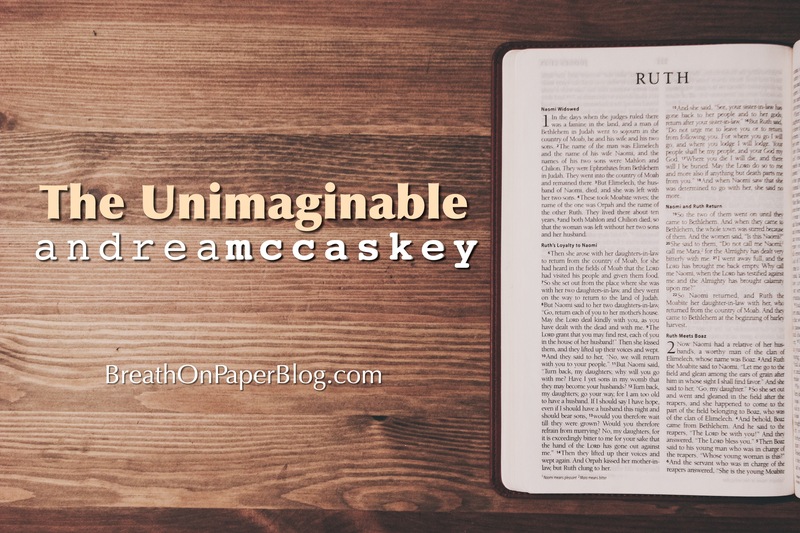 We push away the unimaginable. Can you imagine their despair? Have you been there? In that place where all hope seems gone? I’ve felt despair. Not for Naomi’s reasons, but there was a time when I didn’t see any options. Not because they weren’t there, I just didn’t see them. My sites were set on how big my problem seemed rather than how big my God is. But God always sends a way out if we wait for it. forward to them I have written down Eliza”s words on a sticky note and will refer to them often.I needed this for today.